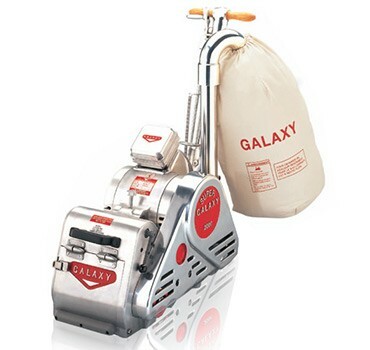 The Super Galaxy 2000 is our best selling floor sanding machine. The Super 2000 is a pure example of creative engineering that combines both a belt sander and drum sander into one machine. Having the ability to use either sanding option allows you the freedom of using either an aggressive sander or a precision sander to finish the project. The Super 2000 has a 8″ drum and is designed to be able to tackle the most difficult projects while producing superior results. Using the continuous 5 h.p., 240 volt motor, you can quickly take on any project with non stop operation. At Galaxy, we recognize that you need the right tools to custom each project to the specific needs that are required. The Super Galaxy 2000 is a perfect fit.